My name is David Jefferson and I live near the historic English market town of St. Albans, Hertfordshire, England. 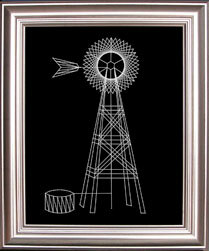 I am a designer of string art and stitching card patterns. I created the patterns available from the String Art Fun, Stitching Cards and Form-A-Lines websites. A palm trees string art pattern has been added to the String Art Fun website. The design features two palm trees on a sunny beach. The pattern is in the general section of the String Art Fun website under Palm trees. This entry was posted in String Art and tagged String Art Fun on Friday 16 May 2014 by David Jefferson. A Shih Tzu puppy string art pattern has been added to the String Art Fun website. The pattern is in the general section of the String Art Fun website under Shih Tzu puppy. This entry was posted in String Art on Thursday 8 May 2014 by David Jefferson. String Art Fun customer Angela has sent us some photographs of string art cross her 10 year old son made using the String Art Fun Value Pack No. 3: Religious Patterns. The picture above is of Cross 1. The baseboard is a wood plaque they purchased from USA craft store Hobby Lobby. It resembles a slice cut through a log with the bark in place. The string art cross is going to be a Christmas present for Angela’s father and I am sure he will treasure it. This entry was posted in String Art and tagged cross, user photo on Wednesday 14 December 2011 by David Jefferson. Primary school teachers looking for a fun maths project for the Christmas term will find it at the String Art Fun website. The string art math projects are suitable for Key Stage 2 Maths (8 – 11 years old). They include numbered patterns and maths question sheets. Designs can be created with pencils and ruler or drawing pins (thumb tacks) and string / wool. There is a free maths project featuring a Christmas pudding with holly. There are also some maths projects to buy featuring a bauble, bells, candles, a crown, a star and a fir tree. The projects are available individually and in a value pack of six designs. This entry was posted in String Art and tagged free pattern, maths, teaching on Monday 21 November 2011 by David Jefferson. 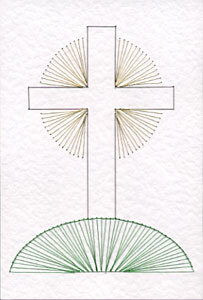 The cross on a hill pattern was originally designed for the String Art Fun website. Following customer requests it has been converted into a stitching card pattern and added to the Stitching Cards collection. Stitching cards are scaled down versions of string art with holes punched in the card and the design stitched with a needle. This entry was posted in String Art and tagged prick and stitch on Friday 17 June 2011 by David Jefferson.